The rule of my life is to make business a pleasure, and pleasure my business. 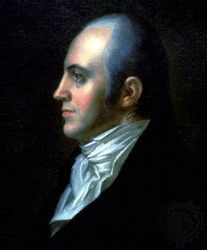 Aaron Burr, Jr. (6 February 1756 – 14 September 1836) was the Vice-President of the United States under Thomas Jefferson, also famous for having killed Alexander Hamilton in a duel. The rule of my life is to make business a pleasure and pleasure my business. Letter to Pichon, reported in Marshall Brown, Wit and Humor of Bench and Bar (1899), p. 67. Reported in Marshall Brown, Wit and Humor of Bench and Bar (1899), p. 67. Alternately reported as "Never do today what you can put off till tomorrow. Delay may give clearer light as to what is best to be done", reported in Jacob Morton Braude, The Complete Art of Public Speaking‎ (1970), p. 84. Reported in Burton Stevenson, Home Book of Proverbs, Maxims and Familiar Phrases (1948). On that subject I am coy. Last words; Burr was an atheist. His last words were a response to the efforts of his friend, Reverend P.J. Van Pelt, to get Burr to state that there was a God. Reported in Holmes Moss Alexander, Aaron Burr: The Proud Pretender‎ (1937), p. 356. Photographic tour with Aaron Burr's grave at Princeton Cemetery.